The FINAT Sustainability, Recycling and Regulatory Affairs Committees are actively working to inform members, initiate new projects and to represent the common interest of the members towards decision makers at a European level in the areas of legislation, recycling and sustainability. Release liner recycling: help spread the message! FINAT has produced a short animated video explaining release liner recycling and its benefits. Feel free to show this message to your customers and help spread the word on release liner recycling. The video will soon be made available in additional languages. Release liner is used as carrier for labels on industrial and consumer goods and fulfills a crucial role in the manufacture, conversion, and application of self-adhesive products. But after fulfilling their role in this process, used liners still have a role to play as valuable feedstock for new processes and products. Currently, a small proportion of spent release liner materials is collected for reuse or recycling. With the growing availability of sustainable and economically-viable recycling solutions, the growing cost of alternative disposal, as well as the increasing emphasis on corporations’ responsibility to society and the planet, this proportion can and should improve. 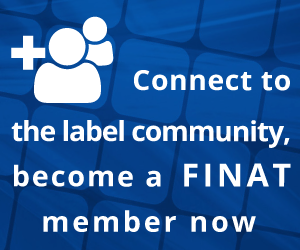 As the European association for the self-adhesive label industry, FINAT has set itself the target to support its member companies to explore and exploit common recycling solutions, and to provide the gateway to identify opportunities for collection and recycling. In addition, FINAT has joined the European Recovered Paper Council (ERPC) and supports the European Declaration for Paper Recycling, which sets out measures aimed at optimising the management of recovered paper throughout the value chain. Why is liner recycling important? Because it pays to recycle. For the environment and for your business. Is environmentally friendly: it contributes to the reduction of the ‘footprint’ of your label company, FMCG brand or private label in the face of growing concerns about the future of our planet and its inhabitants. Has economic advantages: it offers the potential for the reduction of costs associated with the management of secondary release liner materials, compared to alternative disposal methods. Gives you a ‘license to operate’: it provides a potential answer to present and/or prospective legal or market requirements in the context of government or corporate environmental sustainability programmes. Take a look at the continuously developing solutions around, the success stories available, learn from their experiences and explore what the FINAT Recycling Portal can mean for your company! You can spread the word on release liner recycling within your company or to your customers using our promotional package and factsheets. It contains general information on the process, the possible benefits and the contacts of the recycling options. See the download section on the right (top of this page) for the brochure with solutions in various languages.